Identifies the Skansen and the Gröna Lund amusement park. 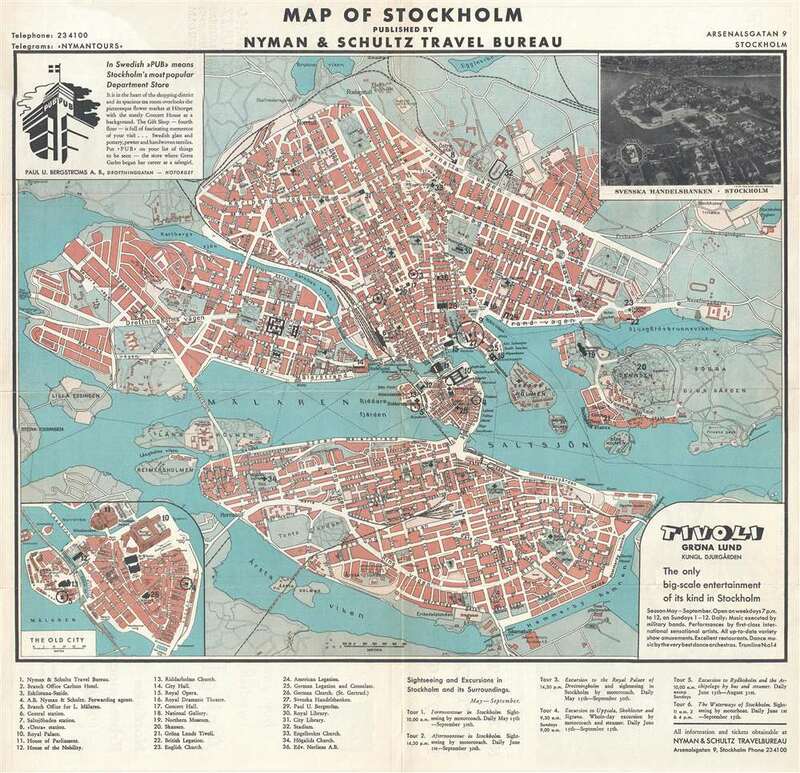 This is a 1935 Nyman and Schultz city map or plan of Stockholm, Sweden. The map depicts the city from Tranebergsund to Durgården Island and from Brunnsviken to Skanstullbron. Highly detailed, myriad streets throughout the city are labeled, as are several churches, parks, and hospitals. Thirty-six different locations are identified numerically and correspond to a key along the lower border. Some of these locations include the Nyman and Schultz office, the Royal Palace, the Houses of Parliament and the Nobility, City Hall, the Northern Museum, and the legations of several foreign nations. Skansen, Sweden's first open-air museum and zoo, is also identified, as is Gröna Lunds Tivoli, an amusement park founded in 1883. An inset of the city center, labeled here as The Old City, is situated in the lower left corner and illustrates the House of Parliament and the Royal Palace in profile, while highlighting the Riddarholms Church and the German church. This map was published by Nyman and Schultz Travel Bureau in 1935. Nyman and Schultz (1861 - present) is a Swedish travel company specializing in business travel. Founded as a shipping and trading company in 1861, the travel company was founded as a subsidiary of the shipping company in 1927 and became its own entity in 1931. Nyman and Schultz was then bought by Scandinavian Airlines (SAS) in 1970 and was merged with Nordstjernans Resespecialisterna AB in 1985 too form the Travel Management Group, which grew to include the Swedish National Railway's travel agency business in 1989. The Travel Management Group changed its name to Nyman and Schultz in 1992. In 1993, American Express purchased Nyman and Schultz and used the name for a number of years, but today the business operates under the name American Express Business Travel. Very good. Light wear along original fold lines. Verso repairs to fold separations. Advertisements on verso.